Mikhail Gorbachev may soon return to Russian politics. As the New York Times reports, the former president of the Soviet Union may join banker Alexander Lebedev and create a new political party in the country. The newspaper notes that Lebedev’s business interests suffered in August and September of this year, when Russia’s stock market fell sharply. Lebedev controls a small business empire, including a 30% share of Aeroflot, and co-owns the Novaya Gazeta newspaper with Gorbachev. He also owns the Moskovksy Korrespondent newspaper, which was shut down and reformatted after publishing a speculative article about Prime Minister Vladimir Putin’s personal life. Lebedev is listed as 358th in the Forbes magazine of the world’s richest people, and had an estimated net worth of 3.1 billion dollars before the market crash. In 2007, Gorbachev was elected the chairman of the Union of Social Democrats, a Russia-wide social movement. 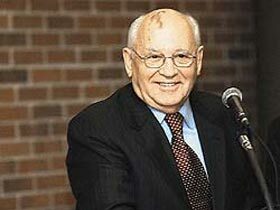 His deputy, Mikhail Kuznetsov, confirmed that Gorbachev has been working on the creation of a new democratic party. In 2002, Gorbachev helped to create the “Social-Democratic Party of Russia,” and later served as its chairman. The party was liquidated on April 16, 2007 by Russia’s registration agency, after the party could not come up with the necessary 500 members in a majority of Russian regions.